Just How More Detailed Are PS4 Characters Over PS3 Characters? Earlier this week, Guerilla Games released a report on the studio's PlayStation 4 reveal demonstration, which had people playing a real-time demo of the new Killzone game. It's mostly super-technical, but there's still enough interesting stuff in there for regular folk to get something out of. While the demo ran at "only" 30fps, it was also running at 1080p. Most current-gen shooters have been lucky to be running at 720p. Guerilla is working with Sony on its own form of anti-aliasing, code-named TMAA. I'm guessing that stands for "Too Much Anti-Aliasing". The game is putting all that GDDR5 RAM to good use. 3GB is there JUST for the visuals. 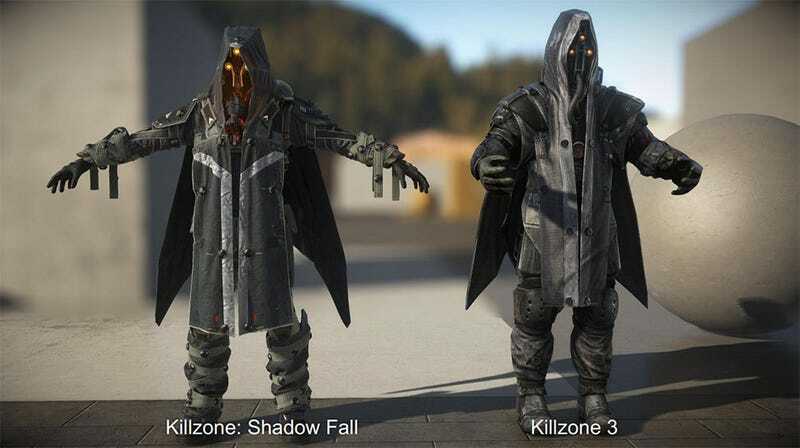 Perhaps of most use for casual observers, though, are the comparisons between the 3D models used in Killzone 3 and those in the PS4 game. In Killzone 3, the average character model had around 10,000 polygons. That number has jumped out to 40,000 on the PS4, resulting in much more detailed people. The same goes for environments; as you can see below, piles of rubble have a lot more...rubble in them. As impressive as this may be in terms of raw numbers, though, I can't help but feel it also highlights the inherent dangers - and risks - in the upcoming generation of games. Sure, 40,000 vs 10,000 sounds like a big improvement, but when you look at those comparison shots (which are admittedly slightly misleading, since the KZ3 character is being shown inside the PS4 game's engine), does it matter that much to justify all-new hardware? You can read the entire report below. Like I've said, it's very technical - it's aimed at helping other PS4 developers - but if you're into this stuff, check it out.